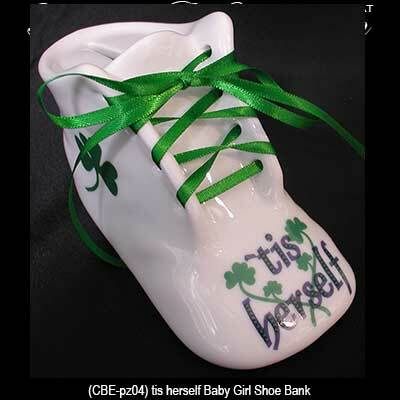 Irish money bank features a 'tis herself baby shoe that is enhanced with green shamrocks along with green laces. The 'tis herself Irish baby shoe bank would make a wonderful child's gift. 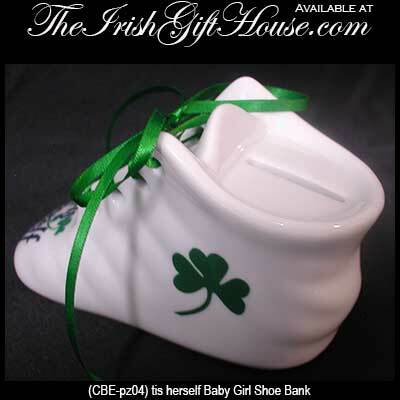 This Irish baby shoe bank features the words 'tis herself along with green shamrocks and shoe laces. The porcelain shamrock bank measures 5" long x 2 1/4" wide x 2 3/4" tall and features a bottom rubber stopper. The Irish baby bank is gift boxed with a shamrock history card, complements of The Irish Gift House.